Jacinda Bullie, front left, leads her students in yoga and movement exercises as part of Uptown's Kuumba Lynx drop-in arts program. Photo by Christopher Danzig. On a foggy November evening, students arrive early for Uptown’s Kuumba Lynx drop-in arts program. Bright pink, blue and white graffiti covers the warehouse-like room’s walls where the program happens, and soon, music blasts from a set of turntables. Teenagers chatter and practice their dance moves, while one lanky young man on a skateboard clatters across the floor. All this, before Kuumba Lynx’s co-executive director Jacinda Bullie officially kicks off the evening. Eventually, she ushers the students into a small dance studio attached to the main room and leads them in yoga exercises. Then the real fun begins. The 30-odd participants–”ages 8 through mid-20s–”break off into groups: Some work on their graffiti art, others head to the disc jockey tables and still others work on their break dancing. Bullie and another co-director Jaquanda Villegas also teach their pupils hip-hop spoken word and poetry performance. Bullie founded Kuumba Lynx–”a combination of the Swahili word for creativity and the name of a small cat with a big roar–”in 1996 with Villegas and Leida Garcia. Bullie, an outspoken 33-year-old who is shorter than many of her students, has big curly hair and a voice hoarse from continually shouting over the rambunctious group. She was raised in Uptown during hip-hop’s heyday, when she and the other co-founders all became involved in the culture through music as emcees, dancers and writers. Bullie, whose stepfather was a Black Panther, saw community activism at a young age. She says early exposure to social justice work shaped the way she thinks. “It helped build our consciousness,” she says. 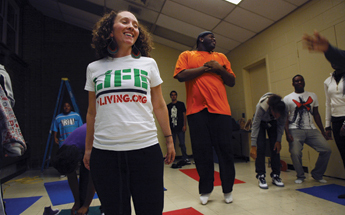 Hip-hop’s power to improve lives plays a big part in her identity. “A part of my culture is telling stories,” she says, and she believes it’s crucial for young people–”especially in neighborhoods such as Uptown–”to find and learn to use their own voices so they can take control of their lives. To accomplish the organization’s goals, Kuumba Lynx offers several programs. There are the drop-in arts programs several times a week in Uptown, community cultural events throughout the year, and arts residencies at schools and community centers across Chicago. Kuumba Lynx also runs a dance and theater ensemble, the organization’s most intensive program. In late November, Bullie sat down with The Chicago Reporter to talk about her program. Why did you create Kuumba Lynx? In 1996, there were a few things going on politically in our city. There was that anti-gang loitering ordinance that basically said kids couldn’t stand around [in groups of] three or more. Also around that time, public schools were cutting lots of arts funding. We had all been connected, celebrating and utilizing hip-hop for our individual selves. But then also we were a part of community things–”positive things–”tutoring programs [and] sports programs that were about empowering young people, giving them a sense of purpose. We found we were not really athletes, but that was the lead push in the community we were in. But we used hip-hop all the time. We were artists. We were writers. We started a pilot afterschool tutoring program in the schools we were teaching in. It started as a performance ensemble. What motivates you in your work? The imbalance that exists in our city and in our world. When I see that young people still don’t feel like their voices matter, that they haven’t learned to hold onto–”to appreciate–”their stories, to recognize that they have a role in the way their life goes. I see such a pull on young people, whether it’s from media or from peer pressure, but I see this imbalance, and I see that they’re not claiming their stories and their experiences and their voices. Now more than ever, those have to be validated. First, by themselves and then by our global world. That’s what motivates me–”that there are untold stories, and there are experiences that our world needs to validate. How has hip-hop culture changed since you started Kuumba Lynx? Hip-hop has been commercialized. We all know that. With that, it’s changed because it’s part of the money game. Hip-hop had a marketable personality, but it’s been co-opted by the commercial industry. Unfortunately, that industry perpetuates stereotypes, glamorizes wealth and impacts the masses’ perception of hip-hop. It’s money-driven; it’s misogynistic. Really, it promotes violence and degradation of women. It allows people to look at hip-hop culture as not participatory in anything progressive. The way we respond is that we provide programs that really help to preserve and promote original hip-hip ideas. It doesn’t mean we’re –˜Old-school! Old-school!’ or we don’t acknowledge some of these more commercially driven rappers. When I say we preserve and promote it, I’m really talking about the original ideas and reason of hip-hop, which has always been about resistance, about self-determination, about community pride, about making constructive life choices. That’s what our programming tries to encompass, while acknowledging that hip-hop is an ever-changing and growing culture. It’s growing up. When you grow up, you sometimes take a job you don’t want to take. You make mistakes–”you learn from them but you remember what your mama taught you. It’s that sort of experience that we’re having in hip-hop. In Kuumba Lynx programs, we’re about trying to create that alternative to some of those ills that young people are dealing with. How is Kuumba Lynx different from other youth service programs in Chicago? It’s a movement for us. Though it’s about youth development, it’s also just a way in which the people leading the organization are living hip-hop culture. They’re using hip-hop as a means to think about the way they spend their money. Using hip-hop to drive the curriculum we push for in our children’s schools, the food that we eat, the businesses that we support, the things we do with our relaxation time, the things that we’re committed to. Not a cult, but a community concentrating on sustaining itself and specifically appreciating brown and black life, and those of marginalized or poor and underserved communities. And recognizing that those voices have to be acknowledged. What is your favorite part of running Kuumba Lynx? My favorite part is hearing young people’s experiences, having them analytically think about issues that everyone’s talking about, but asking them to think about how it connects directly to them and watching them form opinions about the way they want their lives to go, or starting to see the world outside of a box. And most importantly acknowledging what they do matters. It’s not the success of winning a battle or making the dopest poem. That’s beautiful–”but it’s that belief in yourself, and that sense of belonging you capture in the moments when you’re creating art. The way that transcends later in life amazes me. We’re just now at the stage where we see the fruition of that because we had people who were in the program 10 years ago, who now are in college or who graduated from college. When they first came to Kuumba Lynx, they never thought about community, and now they want to be teachers or community organizers. Those are the kinds of things that make you proud: when you see the power of someone’s voice being acknowledged. What’s the hardest part about leading the organization? The hardest thing is seeing the unbalance–”the economic unbalance, the social unbalance. It’s hearing about parents who haven’t had lights for two months. I don’t mean to be the Grinch, but we [city government] hang up Christmas lights all across the city. All of those kinds of inequalities are the hardest thing to swallow in this work. Because every day you are pushing for young people to have hope. Pushing for them to be the best they can be. Be a true reflection of your ancestry. But they open their eyes, read the paper, feel the experiences of their personal lives, and it’s like, –˜but other people aren’t doing that.’ And that’s the most difficult thing.